My path from the Heartland Fall Forum in Minneapolis to the MPIBA Fall Discovery Show in Denver was bridged by a few non-show experiences, including a couple of visits to the extraordinary space that is Open Book, which I'd previously visited for Wi12's opening-night celebration in 2017. But seeing this great facility without being surrounded by hundreds of bookish colleagues was revelatory. 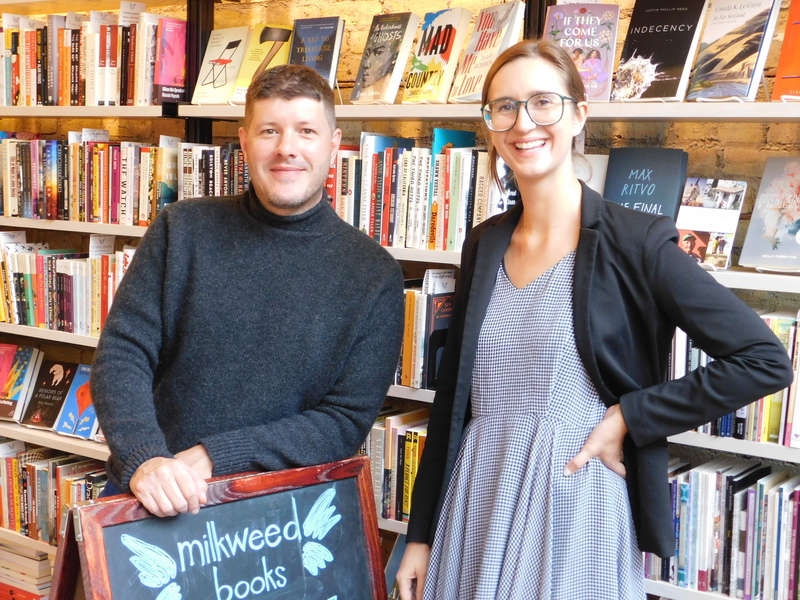 I met with Milkweed Editions marketing director Joanna R. Demkiewicz, then explored the building with Milkweed Books manager Hans Weyandt. I later returned to Open Book for a great poetry reading that featured Ada Limón, William Brewer & Parneshia Jones. "These are people who really have your back," Limón said of Milkweed. I like that thought, and it segues nicely to the perfect finale I experienced the Saturday night before I flew to Denver. I was able to snag a last-minute ticket to a concert featuring singer/songwriter Dessa, author of My Own Devices: True Stories from the Road on Music, Science, and Senseless Love (Dutton), performing with the Minnesota Orchestra. Watching her read briefly from her book to a packed concert hall put an exclamation point on my HFF '18. I'm no poet, but I am trying to tell you that by Thursday morning, I was ready to get back on the Bookseller Trade Show World path again at MPIBA's Children's Author & Illustrator Breakfast. It began, perfectly, with co-hosts Abbey Paxton of the BookBar and Bethany Strout of Tattered Cover Book Store leading their groggy-but-game audience in a spirited, author-themed rendition of the Hokey-Pokey. Then Mac Barnett delighted the crowd with an inside look at his "memoir," Mac Undercover (Scholastic/Orchard), after noting: "It's really good to be back here. Mountains and Plains breakfast was the first event that I ever did for anything for my first book ever. It was literally the first time I ever left my house to talk about a book, and it all started here.... It's so good to be back here. It feels really cool." Andrea Beaty (Rosie Revere and the Raucous Riveters, Abrams/Amulet) said that for her, "the glorious, glorious thing about an independent bookstore is that whatever it is a person needs--whatever that kid, or their parent or their teacher, whoever comes into your beautiful shops needs--there is the thing they need. I always tell people go shop indie because that's how books, like my books originally, that's how all books find their kids. And you guys do that." 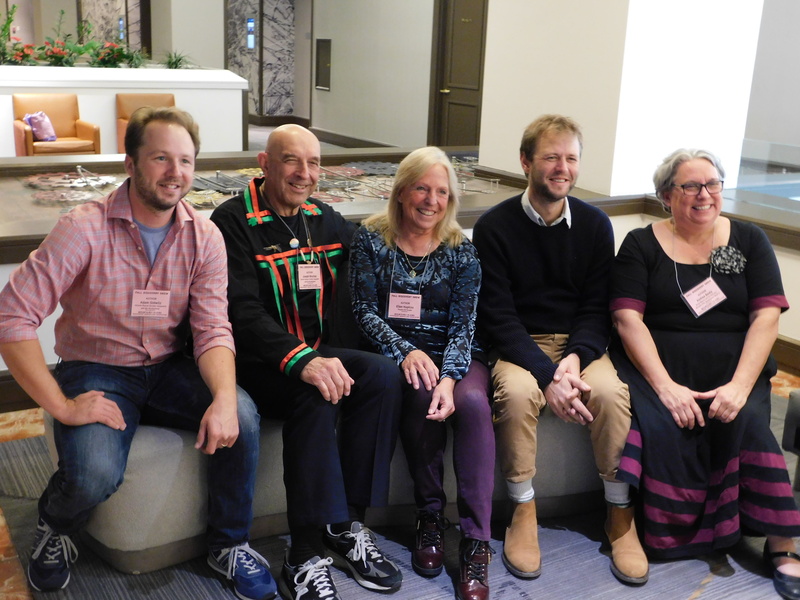 Appearing at the breakfast together were Adam Gidwitz & Joseph Bruchac, co-authors of Unicorn Rescue Society: Sasquatch and the Muckleshoot (Penguin Books for Young Readers). Paths were crossing for me now. I'd just seen Gidwitz speaking at HFF, and I first met Bruchac during the 1990s at the Vermont bookstore where I worked. We often hosted events celebrating his new titles. "Joe is a legend in the storytelling and the music making and the writing communities, both for Native Americans and generally and getting to work with him is just incredible," Gidwitz said, adding: "When we were first writing this book, Joe wrote a line in it which stayed because it's great. He said, 'Folks often forget that we have two ears and one mouth, which means that we should listen twice as much as we speak.' I had never heard that before. The process of writing this series for me has been about trying to adopt that as my new mantra. And I think today with the people that we hear on the television and radio I think listening twice as much as we speak is probably a good mantra for a lot of us right now, especially those of us whose voices have been amplified at the expense of those whose voices have been quieted or silenced." Bruchac, whose latest work is Two Roads (Dial Books), is a solid bridge between cultures, between past and present. "Whenever I travel, I try to acknowledge those people who were here first," he began, asking us to turn our minds to the tribes "whose lands we are on as we speak." He concluded the presentation with these words: "We are all human beings. We need to be tolerant of each other. We need to listen to each other. We need to remember we all have the same heartbeat, we all breath the same air, we all have the same two eyes to look twice before we speak, the same two ears to listen twice as much as we talk. And we as human beings together when we join our hands in cooperation can do great things.... and what comes out is more than any of us could have done alone without the help of those who have guided us along the way. I thank you for listening to us." It was a perfect way to get back on the path. Next week, more on the MPIBA Fall Discovery Show.